Nova Scotia’s new cap-and-trade program will reduce greenhouse gas emissions right here at home. It will also keep the cost of carbon pricing low for all Nova Scotians. With this program and other actions, Nova Scotia will continue to be a national leader in the fight against climate change. Carbon pricing is a way to make polluters pay for the greenhouse gas emissions they are responsible for. It encourages industry and consumers to lower emissions over time. In 2016, the federal government announced that all provinces and territories must put a price on carbon pollution. They can use a carbon tax, a cap-and-trade program, or a blend of the two approaches. We have decided to use cap-and-trade. The cap-and-trade program will start on January 1, 2019. Under our program, we will set annual caps that limit how many tonnes of greenhouse gas emissions are allowed from certain activities in the province each year. The cap will equal the amount of emission allowances that are available each year. Some companies will be mandatory participants in the cap-and-trade program. Each one will get some allowances for free to cover a certain amount of emissions. Companies can trade allowances by buying or selling them. For example, if a company emits more than is covered by its allowances, it can buy more allowances from another company that has emitted less. Each year, we will reduce the cap. There will be fewer allowances available and companies will have to find ways to reduce their greenhouse gas emissions. Putting a price on carbon means you will pay more for some things like electricity and fuel. Fossil fuels that are more carbon intensive will increase slightly more. For example, diesel has a slightly higher carbon content than gasoline so the price of diesel will go up more than the price of gasoline. 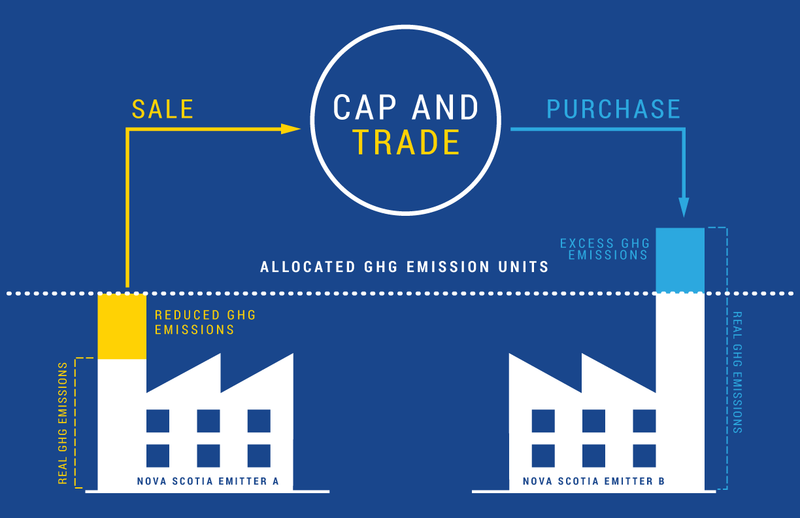 We chose to develop a cap-and-trade program to keep costs as low as possible for Nova Scotians. Cap and trade will cost you less than the federal approach. The program will add about 1 cent per litre to the price of gas, compared with about 11 cents per litre by 2022 under the federal approach. The program will increase electricity rates by about 1%, versus about 8% by 2022 under the federal plan. We can estimate how much prices will go up, but the market will determine the price. You can reduce your costs by reducing your energy use. Learn more from Efficiency Nova Scotia and the Clean Foundation. The cap-and-trade program will be supported by legislation and regulations. While some are still in development, there are some regulations currently in place. Privacy Terms Cookies Crown copyright © 2014, Province of Nova Scotia.